Der Decoder wird mit Drähten ohne Stecker, in 5-er Packungen geliefert. Zur Einführung des Decoders im Frühjahr 2007 steht auch Einzelstückverpakungen zur Verfügung. *) Der Decoder verträgt technisch bis zu 25V. Viele schlechte Zentralen liefern aber hohe Spitzenimpulse im Leerlauf die wesentlich darüber hinausgehen. Daher die Empfehlung nur DCC Spannungen bis 18V zu verwenden. Für H0 wird von NEM so und so nur 14V vorgeschlagen. Schutzvorschlag: kleines Glühlämpchen am Boosterausgang und schon ist das Problem nachhaltig weg. This decoder addresses price sensible model railroaders, who whish access to good quality, especially driving features. The decoder is a new design based on previous cT Elektronik stuff. The goal was to have top of the edge driving features, programming according to DCC specs, 4 function outputs and a extremely attractive price. This caused to leave of less often requested features. For the interested digital model railroader important features like HLU speed limits, stop on asymmetric DCC and preparation for BiDi is implemented. The decoder ships with wires, in a box of 5 units. During the startup phase in spring 2007 there are also single packaged decoders available. 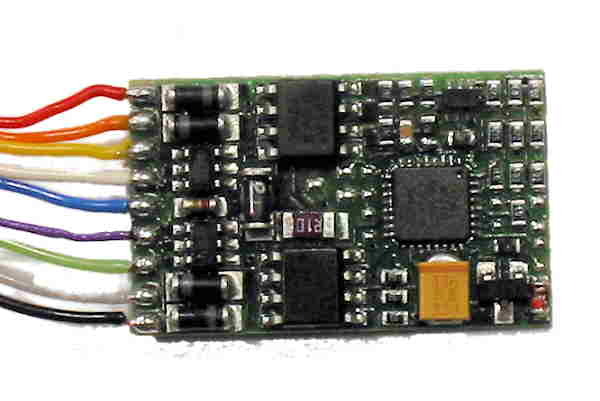 *) The decoder can handle up to 25V. As many command stations deliver extremely high spikes it is recommended to limit the track voltage to 18V. NEM recommends 14V for H0-scale!